Contrary to what many academics might believe, research students can’t constantly work on their research. There is always a need to try and do something that isn’t the constant writing, thinking or data analysis. 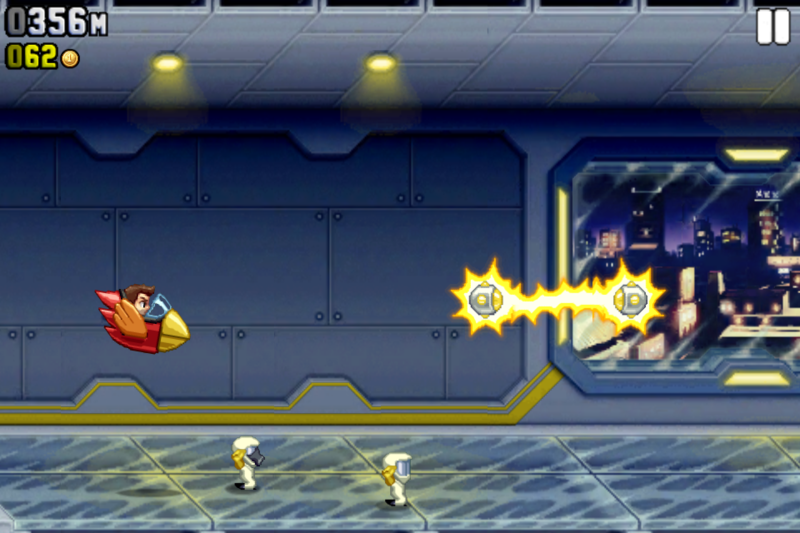 Of late, my choice of break has been Halbrick’s Jetpack Joyride. I normally don’t blog about or review games, but in this case I think it is worth it. Originally the game was 99¢ or $1.99, but the developers of the game made it free. Given how much I play and enjoy the game, the new price of nothing makes me feel a little bit guilty (I did buy an in-app purchase to support Halfbrick on that feeling). The game is s side-scrolling, action, arcade style game with simple controls and simple gameplay. Just try and fly “Barry” (the main character at the centre of the game’s super-involved story) as far as you can collecting coins, tokens and achievements along the way, while trying to avoid comic death by “zappers” and missiles. 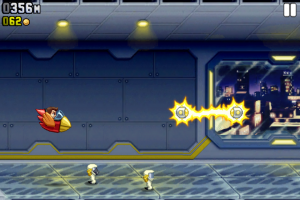 Jetpack Joyride - Angry Birds crossover? The game, while straight-forward, can be a massive time sink. The “one more try” factor in this game is huge and the constantly changing missiones (game objectives) give the game excellent replay value. The choice of “Barry” as the character’s name is as Australian as a thong-wielding, flanny-wearing, roo-riding bogan; but I love the choice of name. The one thing that I would change about the game is the ability for the game to synchronise across iDevices using GameCentre. With the older version of the app, I kept loosing my achievements projects and had to restart the game each time. There was no way to recover achievements or game progress. I know other games sync to GameCentre and allow you to restore on other devices. I’d like to see Halfbrick to do this; although they just released an update that seems to fix the problem of progress loss. My recommendation:Your a fool if you don’t try this game that’s available for free (and is developed by an Australian company).